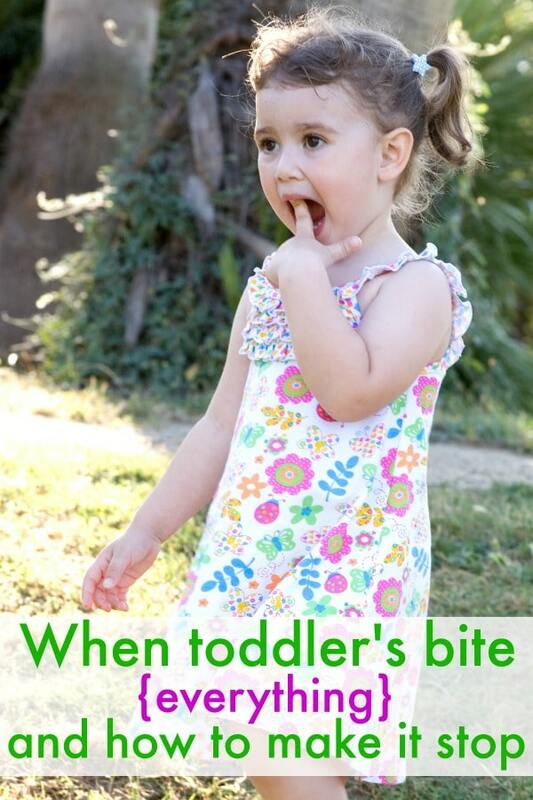 Is toddler biting an issue at your house? This seems to be a common one that parents of one, two and three year olds will face at some point or another. Right up there in the “frustrating toddler stages” with tantrums and not sleeping through the night. Biting is a bit trickier though, because it involves other people. While tantrums are irritating, at least they don’t leave teeth marks. A popular parenting solution these days is to bite the child back. The theory states that in this way the toddler will come to understand that biting hurts and thus quit doing it. I could never get on board with this method. I just can’t wrap my mind around biting my own child and it seems confusing to say NOT to do something, by doing it yourself. Mixed messages are totally not my thing so I knew this was not the route for me. I can respect the desire to communicate that biting hurts. My toddler has never had some one bite him before, and if he is teething I can’t really blame him for wanting to bite everything that he sees. So how does one communicate that biting hurts and it is not okay to bite people, while remaining gentle. One simple phrase made all the difference for our strong willed biter. Yes, really. I told my two year old to bite himself. And he did. He left marks the first time he did it, and then looked at me like I had lost my mind. His little eyes seemed to say “but it hurts mom!”. After trying it out on his own arm and deciding the biting of living things was not as fun as he had hoped, he was offered a variety of other things to chew. Cold carrots, apples, or even a frozen chocolate bar. Anything that would relieve his need to bite or sooth his gums when he was teething. It certainly took more than one reminder. A few days later he was back at it again, trying to naw on my leg in the middle of playtime (I wish I was kidding). A quick reminder “if you need to bite, bite your own arm”, one more much softer attempt to bite his arm and then the decision that he’d much rather participate in a different non-biting related activity. Such a simple thing but it curbed the biting in our house before it became a habit! Do you have biters? How do you deal with biting toddlers? 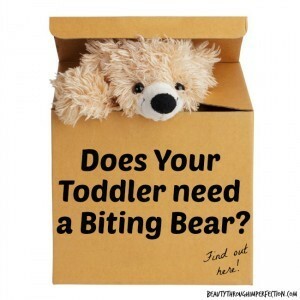 If you need more advice, try out this biting bear idea I learned from a daycare employee I used to work with. Thanks for this Paula! I have a couple biters too but they are 3 and biting out of frustration when someone else has a toy they want. This will come in handy if the 19month old decides to start mimicking the older boys! My husband was a biter, until his much older cousin (probably in her teens at the time) whipped around and bit him back. Supposedly, he never bit again. I guess it works the same way a shock collar works for dogs, but the thing is, for the collar to work, you basically have to shock as the dog barks. If you aren’t biting back while the kid bites, he isn’t associating his biting with the painful feeling of being bit. I’m not condoning biting, btw. My son is/was a biter and we were never able to do anything about it because it only happened at daycare. The handful of times it has happened at home, we have been able to pinpoint a cause, so instead of disciplining, we deal with the problem. Something tells me dooming a tired 2 year old to time out will do more harm than just immediately laying him down for a nap. When my son was three years old I had a very small in home day care. My son had a habit of biting the other three year old. After many bite marks later I had to do something. Thinking of a logical consequence, if he couldn’t be nice with his mouth he wouldn’t be able to use it. Next time he bit her I taped his mouth…… He literally never bit again. This tip is genius!! My newly 3 year old has tried to bite me multiple times in the past week – I’m going to try this tomorrow! I have a 10 month old with a biting problem. She started at 7 months old. I hope to have it solved by the time she is 2, but I appreciated your post as I too can’t wrap my head around the idea of biting her back. Just recently I had an idea. She absolutely hates when I try and clean her nose out when it gets stuffed up. So I thought next time she bites, I’ll pinch her nostrils (no harder than blowing a nose requires), and firmly tell her no. First time I tried it, she stopped. It’s been two weeks, and I can tell she thinks through it because she’ll put her mouth on me during play and her teeth will touch my skin for half a second and then she’ll blow a raspberry instead. I’m still cautious in declaring victory over biting….but it certainly helped. Hey Buddy!, I found this information for you: "Easy way to stop toddlers biting". Here is the website link: https://www.beautythroughimperfection.com/no-biting/. Thank you.